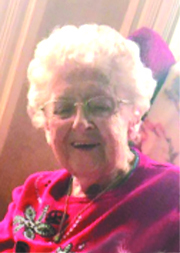 Muriel Boislard, 89, of Saco and formerly of Biddeford, died Thursday, March 21, 2019 at her home. She was born February 8, 1930 in Biddeford a daughter of Henry and Rose (Millette) Guillereault and was educated locally. On November 6, 1948 she married Joseph “Ray” Boislard in St. Joseph’s Church. Muriel had been employed at John Roberts Clothing for 31 years, retiring in 1993. She enjoyed cooking, at which she excelled, caring for her grandchildren, and the company of her cats. She had a great gift for making people laugh. Muriel was predeceased by Ray, her husband of 66 years in 2014. Visiting Hours will be 11:30 a.m. to 1:30 p.m. on Wednesday, March 27, 2019 at Hope Memorial Chapel, 480 Elm Street, Biddeford, ME 04005. A funeral service will follow at 1:30 p.m. in the Hope Chapel. Burial will be in St. Joseph Cemetery. To share condolences online, please visit www.HopeMemorial.com. Muriel’s family wishes to thank the staff of the Wardwell for the loving care they gave to her. Donations in Muriel’s memory may be made to: The Wardwell, 43 Middle St., Saco, ME 04072 or to Compassus Hospice, 163 U.S. Route 1, Scarborough, ME 04074.